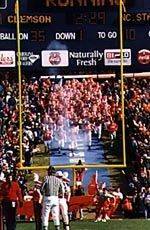 Clemson, SC – Clemson’s Official Athletic Website is providing the fans with complete game coverage of each and every football game of the 2001 season. The “Gameday” page is complete with Tiger news and recaps, player and coach audio, rosters and depth charts, special features, program previews, live game audio coverage, live stats, gameday parking, and other Memorial Stadium information. The “Gameday” page will also be complete with coverage of each Tuesday’s press conference. Fans can access the “Gameday” page each week from the icon on the homepage or from the football page within www.clemsontigers.com. This week the Tigers open play with The UCF Knights at 1:00 PM Saturday, September 1st.